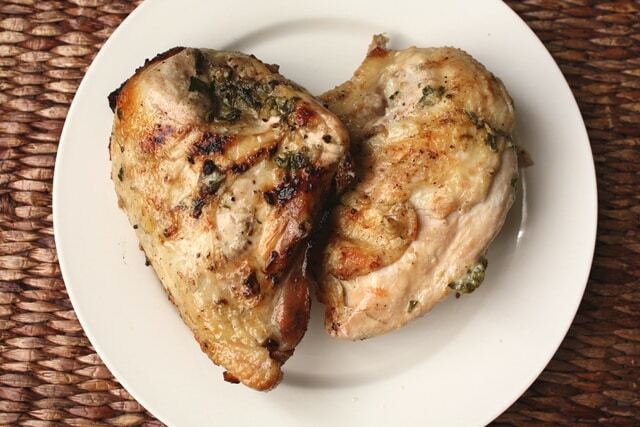 Seasoned with basil, garlic, lemon and lime, this was flavorful and delicious grilled chicken. I wasn’t planning to photograph this meal or even blog it, but it turned out so well; I couldn’t resist. I shot a quick picture of the leftover chicken breasts, so that I could save the recipe for future reference. Whisk together olive oil, lemon, lime, garlic, salt and pepper. Add the fresh herbs and stir to combine. Place the chicken in a lidded container or a large ziploc bag. Pour the marinade over the pieces of chicken. Turn the pieces or flip the bag to coat well. Marinate 8-24 hours in the refrigerator. 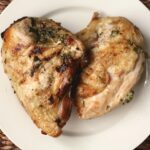 When you are ready to cook the chicken, remove from the refrigerator at least 30 minutes before grilling. Our chicken pieces were huge, so it took almost 45 minutes to cook them. We grilled them over medium-high heat, turning them once every 10-15 minutes. When the chicken is finished cooking, let it rest for at least 10 minutes before cutting into it. This allows the fluids to evenly redistribute throughout the meat. Enjoy! This combo sounds great and looks simple enough to follow. Sounds like a winning marinade. Lemon and lime's acidic sweet bite really wakes up chicken.